Please click here to sell your Lee Blair painting or receive a free art evaluation of your piece. Click to review some of the paintings we've recently purchased by Lee Blair. Lee Blair was born and raised in Southern California. He attended art school in Los Angeles and studied with Pruett Carter, Millard Sheets& Lawrence Murphy. 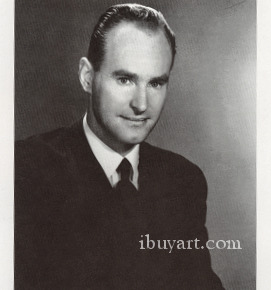 While attending art school Blair won several major awards for his watercolor paintings, including a gold medal in the art division of the 1932 Los Angeles Olympics. Lee Blair became president of the California Water Color Society in 1935, and it was largely through his efforts that the Society shows began traveling nationally and internationally. Throughout his life, Blair produced California Style watercolors. In the 1930s, he was one of the key artists who helped develop this approach to watercolor painting and was a prominent award winner in many art exhibitions. Lee had a unique sense of wit and humor which often came through in his art works and usually determined the subjects he chose to paint. Blair is also known for his innovative work in animated films. He began working at the famed U.B. 1werk Studio, producing art for Flip the Frog cartoons in the early 1930s. He then went on to the Harman-Ising Studios where he worked on Bosco and other innovative cartoon shorts. In 1938, he switched to the Walt Disney Studios, where, over the next few years, he worked on Pinocchio, Fantasia and Saludos Amigos. Lee Blair biography posted with permission of �California Watercolors 1850-1970� by Gordon T. McClelland and Jay T. Last. Copyright Hillcrest Press, Inc. 2002.